There are ghosts in here. Thousands of memories layered up like the dust on top the dust; begging to be brought to the surface and remembered so they can stay alive for one more year or month or day or night. And because they are intertwined with music and friends and laughter, there is a good chance they will live a very long time. I like stories that give away the ending at the beginning. It twists the storyteller’s arm and forces him to work harder to make things interesting. No easy ways out. That being said, Skully’s is halting their Ladies’ 80s Dance Night this Thursday, September 7th, 2017. In the late 90s, our newly formed group of friends spent a lot of time drinking $2.50 32oz beers and dancing to The Digital Underground, Will Smith, Sugar Ray, Ace of Base, Snap!, Blackstreet and Montell Jordan in a basement bar called Clancy’s. The humidity was always just under 98%, there was a pole on the dance floor, and it’s where the phrase “too many witnesses” was created. We had an extremely fun time at Clancy’s over a period of two years. On July 30th, 1998, Clancy’s closed suddenly and like the Israelites wandering in the wilderness, our poor group of friends blindly traversed Columbus, looking for a new bar that could take the place of Clancy’s. In November of 2001, a bar called Skully’s started an 80s music dance night called Ladies’ 80s. What would have been nice is if someone had told our group of wandering souls about it, but we didn’t find out until late 2002. But once we went once, we were hooked. Assume everyone will be going to Skully’s . Meet at a bar around 6pm. Any bar. It helps if they have food. It really helps if it is within walking distance of Skully’s. Have some drinks. Eat some food. Around 11pm head over to Skully’s. Head to the dance floor. Our spot is to the left of the stage, about one staggering drunk person back. When a crappy song comes on, head outside to cool off or smoke a cigarette. When you hear New Order come on, run back inside. Dance more. Buy more Miller Lite. Put the empties in your back pocket until they can be properly disposed of. Try to find some of the regulars. Leave at 2:30am, sweaty, drunk, and exhausted. Regret is for tomorrow morning. Plan to go to Skully’s once a year, twice if Dave comes back in town. Meet at a bar if you can, but usually you have to put the kids to bed, so you get there late or not at all. Around 10pm head over to Skully’s. Walk in and buy 1 Miller Lite. You are the only one there so far. Wait for a bit. Friends arrive! Form a triangle because only three people have arrived so far. Remember to have the contest where everyone guesses what band will be played first that night. (Saying “The Cure” or “B-52s” was a sure winner. Bonus points for risking “The Outfield” or “Yaz.” Text Dave so he can be a part of the conversation. When a crappy song comes on, head outside to cool off, but none of us smokes anymore. When you hear The Cure come on, run back inside. But somehow, more friends do show up after working late or getting kids to bed or watching a soccer game. And we dance. Empty beers still go in the back pocket. Leave at midnight. Got an early day tomorrow. We'll try it again this Thursday. We'll dance. And then that will be it. No more Ladies’ 80s. It’s over. The end of the story. But it’s not over. Not that easily. It was never really about 80s music. Or the characters. Or the beers. It was about friends. It still is about friends. It is about laughing and taking the opportunity to be together. And we don’t need 80s music to do that. I will miss you Ladies’ 80s. We are moving on. But not far. You will always be a photo, a story, or a memory away. And who knows… we danced to 90s music in the 90s, we can do it again. Maybe we will see you and your dusty-self, again. Me and my friends. 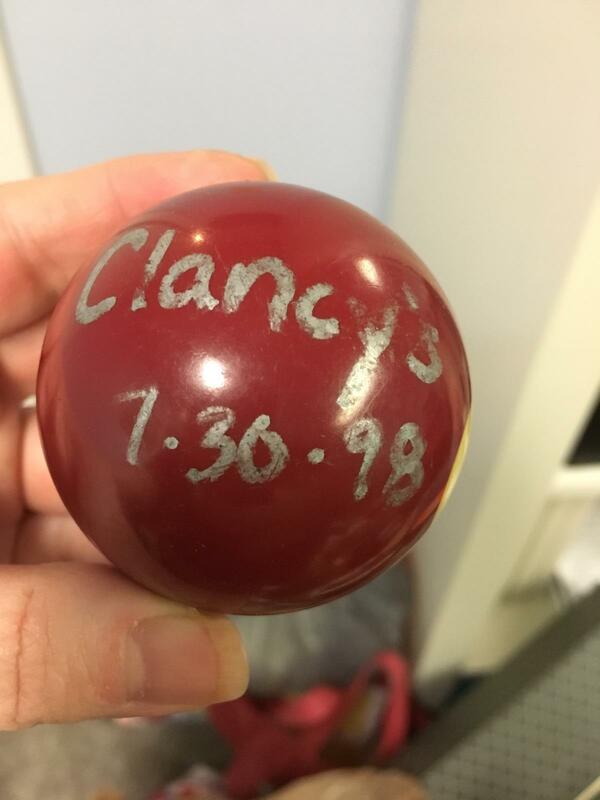 A pool ball, pinched on Clancy's closing night. Zachery Allan Starkey with Freckled Jenn wearing Zachery Allan Starkey.